President Trump’s new tax plan looks a lot like Governor Brownback’s tax plan for Kansas, which had been disastrous for the state’s economy. Rational Republicans should realize that if an experiment fails, and fails miserably, there is no point in repeating it. That is particularly true when the economy of the entire country is at stake. Both the economic theory and Governor Brownback’s experiment with the Kansas economy show that Trump’s tax plan is doomed to fail our country. The tax bills now winding their way through Congress will lead to economic stagnation and an increased in the national debt of $1.5 trillion, both things which are repugnant to rational Republicans. The Theory is based on Laffer’s curve which is displayed at the right. The Laffer curve looks like a normal distribution curve. In theory, if the nation is on the high side of the curve with taxes around 80%, then the curve predicts that cutting taxes will cause a move to the left along the curve, increasing tax revenue. That is likely to improve economic growth. If the nation is on the low side of the curve with taxes around 40%, then cutting taxes will also lead to the left along the curve, decreasing tax revenue, leading to a stagnating economy, and certainly a greater public debt. The United States is now on the low side of the curve with the high marginal tax rate around 40% – so cutting taxes will not lead to increased revenue or spur economic growth. Laffer should know that, but he has abandoned reason and professional ethics and now just supports tax cuts without reference to his own curve. Kansas paid Laffer $75,000 in consultation fees. His advice, when the Kansas economy was tanking, the public debt was mounting, and job growth was decreasing – was to stay the course. Kansas Republicans finally realized that the experiment had failed. They increased the tax rate, and overrode Governor Brownback’s veto of the tax increase. The governor is now leaving the state before his term is up. “Just like the Brownback tax cuts, the Trump plan makes dramatic changes to tax policy by consolidating income tax rates and reworking deductions. Most notably, the Trump plan offers an enormous tax break to individuals who receive “business pass through income.” In Kansas this feature has become known derogatorily as the “LLC loophole”, allowing business income to be sheltered from income tax while people who earn a paycheck must pay tax. At the right is a graph showing job growth in Kansas during Brownback’s years. It is lower than the United States job growth and much lower than in California, which has a high tax rate. Mr. Goossen goes on, “But after five years of the Brownback experiment in Kansas, we know the real result. Kansas has an anemic economy and one of the lowest rates of job growth in the nation. A dramatic drop in revenue broke the state budget, wiped out reserves, significantly boosted state debt, and put public education at risk. And that part about everyone benefiting — well, it turns out that the bulk of the benefits went to the wealthiest Kansans while the tax bill to low-income Kansans went up. The idea that tax cuts will ‘pay for themselves’ or that tax cuts for the wealthy will ‘trickle down’ to the middle class should be added to the list of discredited ideas that sound good but don’t work. The sell job was seductive, but Kansans have the raw experience to grasp that the experiment carried out on us was a failure. The Eisenhower Memorial is now being built and the Kansas politicians are using it as a chance to praise Eisenhower. Eisenhower was a great General and President because he realized that it required requisite resources to get the job done. Under Eisenhower, the top tax rate was 90%. Eisenhower used the money to pay our war debts, rebuild Europe, educate returning GIs, and build the national highway system which ensured economic growth for decades to come. We no longer need a 90% tax rate, but our tax rate is now too low, and cutting it further will deprive the country of the resources it needs. Our current Republican tax plan will add over a trillion dollars to the national debt and will not provide the resources needed to take care of the needs of our country and build for the future.. The tax rate we now have is already too low as the national debt is increasing. Cutting taxes further will surely lead to economic stagnation and an increased national debt, both things which are repugnant to Republicans. A number of selected Republican voters have just received a Trump Agenda survey from the party leaders, along with a request for donations of course. This survey is actually less offensive than some of the Republican polls, but it is still problematic. It is difficult for thoughtful Republicans to answer many of the survey questions as they contain biased assumptions that you must accept if you answer. Below are some of the worst examples from the survey; please see what you think. I did not rank the items as I could not figure out how to rank them all last. I added under Other:_ “reducing medical costs and seeing that all Americans have health care – and ranked it as number 1., because it is one of the things that President Trump has promised. Certainly the bills that came out of Congress so far will not even begin to do that. Question 6. was particularly troublesome as it asks about an executive order to suspend government unions to make it easy to fire government workers. This would remove worker protections against unreasonable terminations, and make them subject to political influence. Question 8. asked about taking whatever steps necessary to have president Trump’s court appointments approved. We have procedures in place for approving judges, and we should just follow them. Question 9. asked about whether the Democrats have any intention of working in good faith to address issues pressing our nation. Of course they do, but they may object to the way the problems are addressed, as is their right. Question 10. asks if we are optimistic that President Trump and Republicans will pass reforms and conservative policies to improve our economy, strengthen our security and protect our freedom. The devil is in the details on those policies, but from what I have seen so far I would answer “No”. Question 11. asks if we believe that Mainstream Media will give president Trump fair, unbiased coverage of his proposals and leadership. Of course they will, but there is already evidence that the Trump administration is claiming the truth to be unfair. One problem with the survey is that it is not anonymous. Republican leaders who plan to run for office may refuse to complete the survey for fear that the Republican Party will work against them in the Republican primaries in their next election. It is exactly those leaders whose opinion should carry the most weight. Another problem with this survey is that it is likely that those who agree with the biased assumptions will send in the survey, while many mainstream Republicans will just ignore the survey, further biasing the results. My concern is that the Republican leaders will use the results of this biased surveys to try to whip into line the candidates who might object by telling them, “This is what the Republican voters want.” But is it really? I have filled out Republican several surveys like this, but have never seen the results, though I have searched. Perhaps it doesn’t matter what the results were, because the survey’s main purpose seems to be to provide propaganda and to request donations. Trumps new tax plan looks a lot like Gov. Brownback’s tax plan for Kansas, which had been disastrous for the state’s economy. It is based on Laffer’s curve which is displayed at the right. The Laffer curve looks like a normal distribution curve. If the nation is on the high side of the curve with taxes around 80%, then the curve predicts that cutting taxes will cause a move to the left along the curve to increased tax revenue. That is likely to improve economic growth. If the nation is on the low side of the curve with taxes around 40%, then cutting them will lead to the left along the curve, toward decreasing tax revenue. That likely leads to a stagnating economy, and certainly greater public debt. Given that the same economists who advised Brownback now advise Trump, it’s unsurprising that his administration uses similar arguments to sell its plan: the tax cuts will grow the economy and create millions of jobs; the tax cuts will pay for themselves; everyone will benefit. Brownback said all that, too. But after five years of the Brownback experiment in Kansas, we know the real result. Kansas has an anemic economy and one of the lowest rates of job growth in the nation. A dramatic drop in revenue broke the state budget, wiped out reserves, significantly boosted state debt, and put public education at risk. And that part about everyone benefiting — well, it turns out that the bulk of the benefits went to the wealthiest Kansans while the tax bill to low-income Kansans went up. The idea that tax cuts will “pay for themselves” or that tax cuts for the wealthy will “trickle down” to the middle class should be added to the list of discredited ideas that sound good but don’t work. The sell job was seductive, but Kansans have the raw experience to grasp that the experiment carried out on us was a failure. Note added on 11/05/2017: The Eisenhower Memorial is now being built and the Kansas state politicians are using it as a chance to praise Eisenhower for his great leadership. However, they should have learned the lessons from Eisenhower’s leadership. Eisenhower was a great General and President because he realized that it required requisite resources to get the job done. Under Eisenhower, the top tax rate was 90%. Eisenhower used the money to pay our war debts, rebuild Europe, educate returning GIs, and build the national highway system which ensured economic growth for decades to come. Our current Republican tax plan will add trillions to the national debt and will not provide the resources needed to take care of the needs of our country and build for the future. It is being sold as a tax cut for the middle class, when most of the benefits go to those already wealthy We certainly do not need a 90% tax rate, but the tax rate we now have is already too low, and cutting taxes further will lead to economic stagnation and an increased national debt, both things which are repugnant to Republicans. 1. Middle class taxpayers. They receive a small rate cut but will lose many of the deductions they rely on. 2. Teachers. They will no longer be allowed to deduct school supplies paid for from their own pocket. 3. College students. The amount of deductible student debt interest has been cut from $2500 to $202 and graduate students will now be taxed on research and teaching assistantships. 4. Mortgage holders. The home mortgage interest deduction will be cut about in half and there is now a limit on how much taxpayers can deduct for state and local property taxes. 5. Charities. A higher standard deduction reduces the number of people who will itemize and claim charitable deductions. Being fiscally conservative requires making a sound national budget and raising the revenue to fund our nation’s needs. The logical approach to paying off our national debt is to find middle ground between raising taxes and cutting spending. The tax rates, particularly those at the top of the earning scale, need to be adjusted upward,and there is also a grave need for spending restraint, elimination of duplicate efforts, and the elimination of waste and wasteful projects driven by special interest groups on both sides of the aisle. Since few Congressmen are willing to vote to cut pet projects, and perhaps lose their own, it leaves us with just one alternative: ” Just raise taxes”. As the chart below shows, cutting taxes does not necessarily lead to greater economic growth, but it certainly means a large increase in our national debt. The high tax rates and increasing national debt under the Eisenhower administration were mostly to pay off our war debts and rebuild Europe, yet there was also growth in GDPand and jobs. Reagan dramatically cut taxes, and experienced a lower growth in GDP, more jobs, but also a large increase in peacetime national debt. If you wonder why a country as rich as ours is going broke, it may be because of Arthur Laffer‘s economics, Grover Norquist’s anti-tax pledge, and ALEC. We should not let men we did not elect or some secretive organization that represents special interest groups determine our tax policy. If you will remember, under Eisenhower, the top tax rate was 90% and we used the money to take care of our soldiers, send them to college, rebuild the countries devastated by war, and build the interstate highway system that fueled economic development for the next several decades. Now we have cut the top tax rate, the corporate tax rate, the capital gains tax, and were now working on cutting the inheritance tax, while we are also cutting the safety nets and help for the poor because we cannot pay for them. We are better country than that. Norquist claims 235 US Representatives and 41 US Senators have signed his Pledge. In doing so, they have clearly given up their responsibility as our elected representatives. Those in the US Legislature who have signed the pledge are listed here. You may wish to check see who from your state has signed the pledge and contact them. Since Norquist claims that signing the pledge is binding into perpetuity, I would suggest that we make sure none of those who signed his pledge are re-elected. The framework for nuclear deal with Iran has now been approved with the details to be worked out later. Eventually the Senate will be called upon to ratify the final treaty, and it is important that we begin building support for the treaty in Congress. 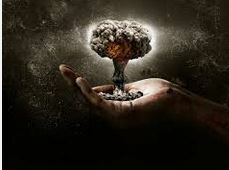 A war between Iran and Israel would destabilize the Middle East further and lead to unthinkable war and terrorism. Please write your Senator, and also your Representative as well, to ask for their support. Below is a letter that I sent to my Legislators, which you may use for ideas. I am sure there will be several petitions circulating about this, but sometimes a personal letter carries more weight. The US had many Iranian students and friends back in the 60s and 70s who thought America was great. When the Revolution started, many of them returned home to protect their families. Iran has been under the control of extremists for over 30 years and the moderates have just recently been able to elect a president who wishes to improve relationships with United States and remove the sanctions on their country. If we think we have trouble in the Middle East now, imagine how it would be if a war started between Israel and Iran, and the radicals seize power again. While the negotiated agreement may not be all we would wish, we should give it a chance. Under the framework, Iran would give up two-thirds of its centrifuges used to enrich uranium and would reduce its stockpile of low-enriched uranium from 10,000 kilograms to 300 kilograms. These two things alone would diminish Tehran’s ability to produce a nuclear weapon. Its nuclear apparatus would be smaller, and under these guidelines, Iran’s pathway to nuclear weapons, while certainly not impossible, would be much more difficult. Iran would convert its underground nuclear reactor, which could produce weapons grade plutonium, to one which could not and would be used primarily for research purposes. The agreement contains inspection and verification to see that Iran complies fully. Please support the agreement. It is not just a treaty with United States, but with six other countries and the European Union. Our failure to approve it would cause trouble with our allies, who are anxious to put an end to this crisis, and could lead to a devastating war in the Middle East. Note added on 1/06/2016: Most people don’t realize how close we came to a catastrophic war between Israel and Iran over Iran’s nuclear program. As agreed in the nuclear treaty, Iran recently shipped its stockpile of over 25,000 pounds of low-enriched uranium materials to Russia, ensuring that Iran’s nuclear program will be peaceful going forward. This is a guest post by Barbara Moore. Hearing that voting was not a Constitutional right and that it is not mentioned in the United States Constitution made me feel kind of disillusioned. Wait a minute, as a woman I am well aware of the hard won right for women to vote. I know this is protected in the 19th Amendment of the United States Constitution. The 19th Amendment plainly states, “The right of citizens of the United States to vote shall not be denied or abridged…” The RIGHT of citizens of the United States to vote should be clear enough as it is used here – for even those who say that the right to vote is not in the Constitution. But, if that is not enough, the right to voteis also mentioned four other times in the Constitution. As well as the 19th, it is mentioned in the 15th, 24th and 26th Amendments to the Constitution. 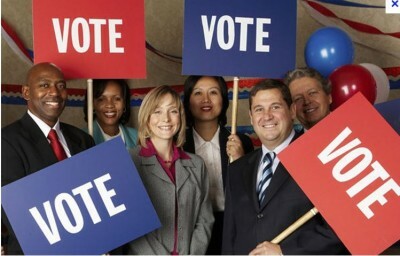 Each time it plainly states the right of citizens of the Unites States to vote…. Unfortunately,the need for the four special Amendments has been due to the injustice of political manipulation. Perhaps, sadly, even with these protections of the right to vote, we have not seen the end of political attempts at the manipulation of citizens’ right to vote. Here is a link to a very good article by Garrett Epps who teaches Constitutional Law. 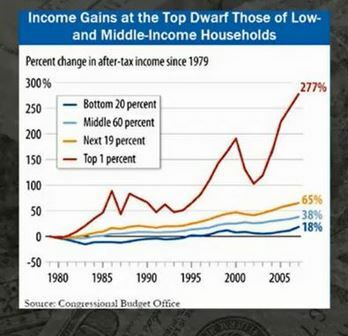 The Trickle-down Theory, has been around a long time. Back in the 1800’s, they called it the Horse and Sparrow Theory. If you feed the horse enough grain, some of it will be left over for the sparrows. No economist took it seriously. 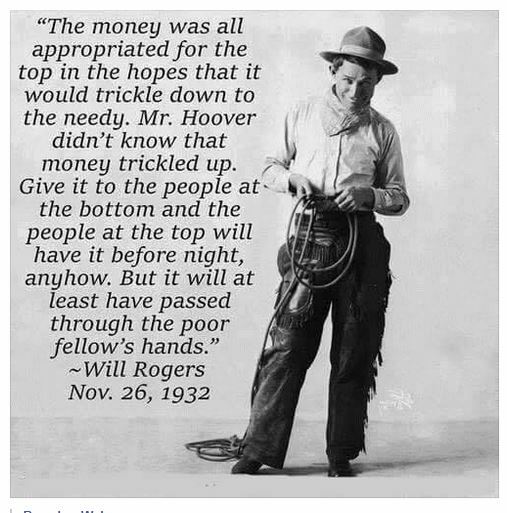 By Will Rogers day it was called the trickle-down theory and the picture shows what he thought of it. Eric Laffer convinced Ronald Reagan that he should try Laffer’s version of it, and the economy grew less while the public debt ballooned. George W. Bush tried the same thing, and that plus two unfunded wars put our nation deeper in debt. At the state level, Oklahoma has tried their version of it. They are now having to make cuts in education, infrastructure, the salaries of public workers, and pension plans. Even yet, Oklahoma is cutting taxes even more next year thinking that the problem is that they just have not tried it hard enough. Governor Sam Brownback has put Kansas deeply in debt with his experiment, he calls it, with the trickle-down theory. He refuses to raise taxes even though there is $179 million budget shortfall. Governor Brownback, too, thinks the problem is that Kansans just have not wished hard enough that Tickle-down Theory will work. He is also wishing that the $500 million budget deficit projected for next year will somehow magically go away. Will Rogers had the theory right. Money trickles up and pools at the top. Those at the top really like that, and they pour campaign money to politicians who will try keep trying the Trickle-down Theory. If there is one good thing that comes out of Brownback’s experiment in Kansas, it will prove once and for all that the Trickle-down Theory does not work. Why should it, it never has. At one time, most American companies saw their role as being responsible to their stakeholders, i.e., being a good corporate citizen and taking care of both its stockholders and its workers. There was a change in the 1980’s toward increasing shareholder value, i.e., a shift toward considering the companies’ profits to be primary even if it hurt the rest of its stakeholders. The graph at the right shows how that change affected our economy. 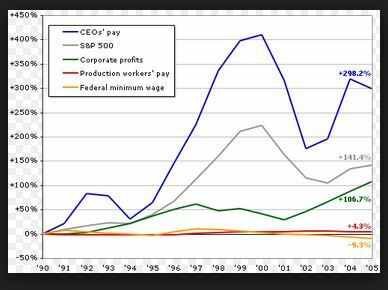 Corporate profits increased, CEO pay increased remarkably, and worker wages stagnated. An example: Wal-Mart is a good example of that shift. As with many companies, the corporate culture changes when the founder dies. Sam Walton believed you should buy American and that you should treat workers fairly, a policy of maximizing stakeholder value. His heirs apparently thought that profits should be the main goal, a policy of maximizing shareholder value, and in the process making themselves fabulously wealthy. The company now imports many of their products and pays its workers poorly. Wal-Mart just announced that it may raise its minimum salary to $8.50 an hour. The Tulsa World editorial board approved saying,” If they (the workers) earn more, they will spend more, spurring the economy. They also will be less prone to need government entitlements such as food stamps.” True, and while the salary increase may sound generous, it really isn’t. In 2009, when the minimum wage was raised to $7.50, Wal-Mart stock was worth $50 a share. In 2014, workers still earn only $7.50, but the stock is now at $88. If wages had kept up with the stock price, the minimum wage worker would get $13.20. Earnings: Corporate earnings are one of the most closely watched indicators of a company’s profitability. Stock prices reflect the companies earning or its potential for earnings. Wall Street likes it that way, as it boils a company’s value down to one number which can be measured or approximately estimated for the future. CEO salaries are closely tied to their stock’s performance, making increased shareholder value the primary goal of the company. This leads to policies which boost the company’s earnings and the CEO’s pay in the short term, even though it may hurt the company in the long term. That’s why most CEOs insist on Golden Parachutes which make them fabulously wealthy even if the company declines in the future. Rewarding CEO’s for increased profits had led to policies that created a huge pay gap. While in 1980 CEO earned 42 times as much as an average worker, that gap has grown to 354 times as much. Abuses: Salaries are one of the biggest expenses for most companies, and keeping average employee salaries low increases profits. Announcing layoffs, though it may reduce a company’s future productivity, is often rewarded with an increase in stock price. Some companies resort to practices such as shifting earnings overseas, setting up tax havens, or ignoring safety and environmental regulations which would cost money to implement. These policies hurt the workers, damage the US economy, and sometimes shift a companies business expenses to the US taxpayer. Many companies justify these practices by saying that they are following the law, but we should not forget that many of the laws were made by politicians influenced by lobbyists and money. Even though they are following the law, the ethics and the patriotism of those companies are questionable. Stakeholders: Though Wall Street and CEOs may profit from the focus on shareholder value, there are other stakeholders in the company who should be considered. Workers have a stake in the company as their well-being depends on it. Yet, low pay makes workers lives miserable and many of them must sacrifice time with their family in order to take a second job. Taxpayers also a have a stake in companies. Tax avoidance and tax havens reduce tax revenue and add to the national debt. Shifting jobs overseas hurts American worker’s buying power and reduces their contributions to income taxes. Workers who are unable to afford health insurance or enough food for their family are forced to apply for government assistance. This shifts the burden to taxpayers and the reduced purchasing power slows the economy. Cutting corners on safety means damage to worker’s lives and health and puts a burden on our healthcare and workmen’s compensation system. And, we are all stakeholders in the environment as clean air, pure water, and a hospitable environment are considered our birthright. 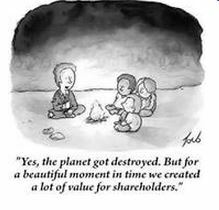 Stakeholder value: The idea that corporations exist to reward shareholders arose not from law but from the work of ideologically driven economists. It’s a shift that Wall Street and corporate executives brought about, as they reap the rewards. They argue that shareholder capitalism will bring about the greatest good for our society, but in reality it is created economic inequality that is destroying the quality of life for a majority of American citizens. As a contrast, Germany has adopted an emphasis on stakeholder values. German corporation are required by law to have at least 50% of hourly workers on corporate boards. German workers are involved in decision about wages, healthcare, pensions, overtime, vacations, and other decisions that affect them. The workers certainly have an incentive to see that the company succeeds and they have more security and opportunity than ours. Germany has the strongest economy among the European Union countries and a much greater after tax economic equality . Socially responsible investors recognize the value of considering all the stakeholders in a company. Many retirement funds and investment firms have social choice investment funds. The fund’s investments favor companies that are strong stewards of the environment; devoted to serving local communities; committed to higher labor standards; dedicated to producing high-quality and safe products; and those managed in an exemplary or ethical manner. Though the funds are chosen for their ethical values, some of them do quite well. The TIAA-CREF Social Choice Equity Fund, for example, now has $2.6 billion in assets and has grown at the rate of 15% a year for the last five years. Socialist choice funds are often less volatile as they are more immune to the wild swings in stock prices that occur when earnings reports come out. Another factor driving the shift toward stakeholder investing is the choice by socially responsible institutions to divest from corporations which have a history of worker or environmental abuses. At its 2014 meeting in Geneva, the Central Committee of the World Council of Churches (WCC), a fellowship of over 300 churches which represent some 590 million people in 150 countries, endorsed fossil fuel divestment, agreeing to phase out its own holdings and it encouraged its members to do the same. Social entrepreneurism: Is not likely that the United States will pass laws requiring more emphasis on stakeholder values, but there is beginning to be a shift in that direction. There was recently an entrepreneurial seminar which promoted “Social entrepreneurism: the tricky balance of doing good while doing well”. It pointed out that twenty-seven states have passed legislation to make ”for benefit corporations”, called B Corporations, possible. These are tax paying for-profit corporations which include an explicit social mission in their corporate charters. One example is Grameen Bank, an organization that popularized micro-credit, which makes small loans to impoverished families in developing countries so they can invest in small businesses. Its founder was recognized with a Nobel Prize. Another example is Ben & Jerry’s ice cream, with its explicit corporate emphasis on social causes, such as paying more for sustainably grown milk, sugar, eggs, vanilla and chocolate; curbing climate change; and mandatory labeling of genetically modified organisms. People are apparently willing to pay more for a product from companies that emphasize stakeholder values. The chart at the right compares the 1956 Republican platform when Eisenhower ran with what the party’s platform seems to be today. Some things evolve, and some things devolve. The modern Republican Party is an example of the latter. Trying to hold power, rather than govern well, the party has molded itself to satisfy the religious right, the anti-science anti-intellectuals, the false conservatives, and the very wealthy. Unable to progress as the world changes, without offending those, the party leaders have taken the path of obstructionism. It is a rather vicious cycle for Republicans. As moderates and progressives move away from the party, the extremist are more in control. That influence is seen most in the primaries where the extremist and money interests can insert more influence to elect their candidates. It is tough to be an Eisenhower Republican these days. 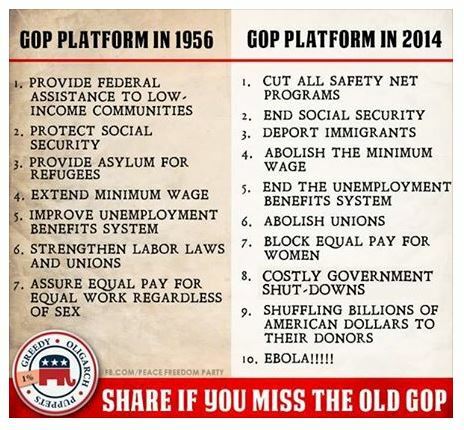 The 2014 platform is very similar to that developed by the Republican Party in 2012. Republican leaders used a push poll to develop the 2012 Republican presidential platform. Here is an analysis of that poll. The poll was an affront to intelligent Republicans as it was not really to solicit their opinions but instead an effort to spread propaganda and to raise money. It signaled the big money interests and extremists that if they gave generously, the Party would reward them. And it did. Here is an analysis of the 2012 Republican Party platform that Romney ran on. Can any Republican actually be proud of that platform? It is no wonder Romney lost. Which platform in the chart do you prefer? It will never be 1956 again, but think where we might be today if the Republican Party had remained progressive. It is time for the Grand Old Party to become Grand again.